Southworth Sailor: You did what?!!! My adventure this past week might seem a little foolhardy. Driving a sixteen year old truck with 200k for 3500 miles to pick up a 30 year old boat and trailer would to some people seem like sheer stupidity; which is what I did feel at times. 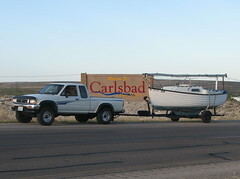 Leaving Saturday morning and returning Wednesday night, I drove to Carlsbad, New Mexico to buy a boat. You would think that there would be plenty of boats in the Puget Sound, that such action was unnecessary. But the lack of availability of this particular boat on the used market for a decent price convinced me to go for it. More about the boat will follow in future blogs. I purchased the boat from a Urologist who sailed it in a bathtub -- reservoir for the last ten years. The condition of the trailer made me very apprehensive about the return trip. I had the bearings repacked and hoped for the best. Unfortunately, though both tires had plenty of tread, they blew up in the heat of the road: one near Gallup, NM and the other near Baker City, OR. Other adventures of the trip included having my cell phone stolen at a rest area, being three cars behind a head-on collision with 2 fatalities, and having my mast break loose on I-5, forty miles from home. Needless to say, I am very THANKFUL to be safely at home in Southworth with my prize boat in the driveway. You must have some of your Bulthuis grandfather in you — and your great grandfather Bulthuis (Chicago Claude)! Adventuresome, to say the least. My dictionary of synonyms: "willing to incur hazard, daring, courageous, brave . . . venturesome, fearless, enterprising, intrepid, undaunted."